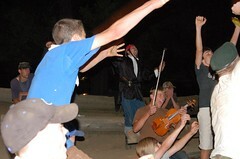 The evenings were spent around the campfire singing, performing skits, and otherwise making merry. 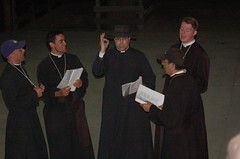 Judging by the look on Mr. O’Neil’s face, they must be singing “Danny Boy”. 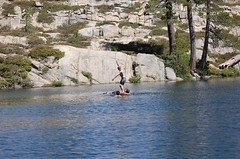 Swimming after a long hike in the Sierras. 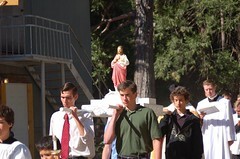 The week came to a close with a Sacred Heart procession followed by solemn high Mass in the chapel. My thanks to Ken for directing me to Flickr. I thought the boys were lucky when I saw the first set of photographs, but the last picture in this post shows how truly blessed they are to be able to attend this camp. 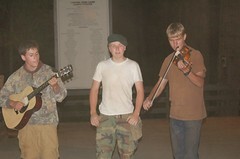 Can you send a link on this camp? I’ve two boys that in a few years will be suited to it! Thanks! Steve: I don’t think this camp has a link. It is organized by the priests of St. Stephen the First Martyr church in Sacramento, which is linked in the sidebar under “Local Interest”. I’m sure your boys would benefit greatly!